In early 2012, a promising experimental antidepressant failed to make any impression on American patients in last-stage trials, forcing its developer, a small US drug company called Targacept, to call off further research on the drug. The fiasco came as an unexpected shock especially as the drug, labelled TC-5214, had earlier passed with flying colours in trials on Indian patients. He might have added to the rogue gallery more countries from Asia and Eastern Europe, like China, Bangladesh, Poland, and Ukraine, which have become hotbeds of clinical trials for Western drug companies in the past two decades. Reliable data on offshore trials are notoriously hard to get because drug companies are not required to report them, but just to give you some idea about the offshore clinical trial mushroom, according to the US Department of Health and Human Services, the number of trials for drugs meant for the American market rose from a modest 271 in 1990 to a staggering 6,485 in 2008, a spike of over 2,000 per cent! And early in September, an investigation by an online health paper called statnews.com revealed that 90 per cent of new US drugs approved this year were tested at least in part outside the US and Canada. This trend worries a lot of people as offshore clinical trials are plagued with a litany of allegations—sleaze, lax laws, lack of scientific rigour, unethical practices like not taking informed consent or not compensating patients, and outright fraud like fudging of data. If drugs cleared by suspect offshore trials could endanger the lives of not just unsuspecting patients in the developed world (according to one ballpark estimate, every year about 200,000 Americans die of prescription drugs) but also poor human guinea pigs in the developing world, what explains or justifies the rise of offshore trials, one might ask. Many reasons. Until the early 1990s, most clinical research was conducted by public hospitals and universities. This is not to say that they were without fault—in fact, they were guilty of some of the most egregious unethical experiments on blacks and prisoners. In the most infamous case called the “Tuskegee Study” that began in 1932, the US Public Health Service entrapped about 600 African-American men to take part in a clinical study of syphilis. They kept them on the hook for 40 years with free meals and free medical care, while never telling the infected that they had the disease nor that penicillin could cure it. An expose by a whistleblower in 1972 led to stringent laws protecting the rights of the clinical subject. The new laws did ensure some degree of accountability in publicly-helmed clinical research. However, as governments removed themselves from the picture, private capital moved in quickly to capture a large slice of the clinical research pie. And before long, they had moved offshore in search of greater profit. It’s not too difficult to understand why. For one, it’s much cheaper; two, laws are lax; three, it’s easy to bend rules with bribes; four, it offers a much larger, cheaper and diverse stock of patients to recruit from; and finally, it’s far easier to find what in industry-speak is called a “drug-naive” patient—someone who is not on drugs that are likely to confound the trial results. Ultimately, the bottomline is to get a drug approved, for which there is an inbuilt proclivity to cheat, fudge, conceal, cut corners, and lie. By the time the cat is out of the bag, the drug has earned the company so much profit that it can afford to hedge its bets against possible penalties, if any. In 1999, Glaxo hid data on safety risks about its anti-diabetic drug Avandia, but by the time it was found out in 2007, the drug had done business worth billions of dollars. It paid over US $3 billion to settle lawsuits. No surprise then that clinical trials today are a multibillion dollar profit-making machine fitted with ever new cogs like recruitment firms, medical communication agencies, research investigators, and, ridiculously, even for-profit ethics review boards. But the most powerful cogs are the CROs, such as Parexel and Quintiles, which are pretty much the overlords of the global clinical trial business. It’s evolved into an efficient food chain with a pecking order that ensures profit while diffusing accountability. In this dog-eat-dog business, each player must protect its immediate patron—shareholders, drug companies, for-profit ethics review boards, CROs, recruitment agencies, hospitals, research investigators, and volunteers, in that order. Take the small but important cog called the research investigator. Her brief is not to do original research but merely to oversee the smooth running of the trial. Insiders refer to them as “phantom investigators” as they are hardly ever around the trial site. Yet, they are paid handsomely. In anthropologist Adriana Petryna’s 2009 book When Experiments Travel, a CRO employee tells her that “in Russia, a doctor makes two hundred dollars a month, and he is going to make five thousand dollars per Alzheimer’s patient”. But the most valuable, not to mention most vulnerable, actor in this elaborate sordid drama is the patient. Mostly, they are illiterate, sick, and, importantly, so poor they can’t afford the treatment. Often, when a drug fails trial in their home country, drug companies go hunting for patients in what are called “rescue countries” like India, China, Russia and Brazil. 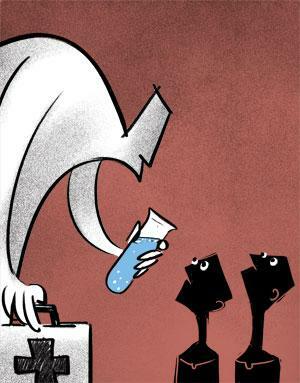 In India, clinical trials are blemished with allegations of sleaze, unethical practices, and flagrant violations of whatever little precious safeguards afforded to the patients. A 2012 Par-liamentary Standing Committee concluded that drug companies, international non-profits, CROs and government agencies were all partners in crime against hapless, poor patients. According to figures put out by the health ministry, 3,458 people died and 14,320 suffered “adverse events” (industry-speak for life-threatening complications) during trials conducted between 2005 and 2012.